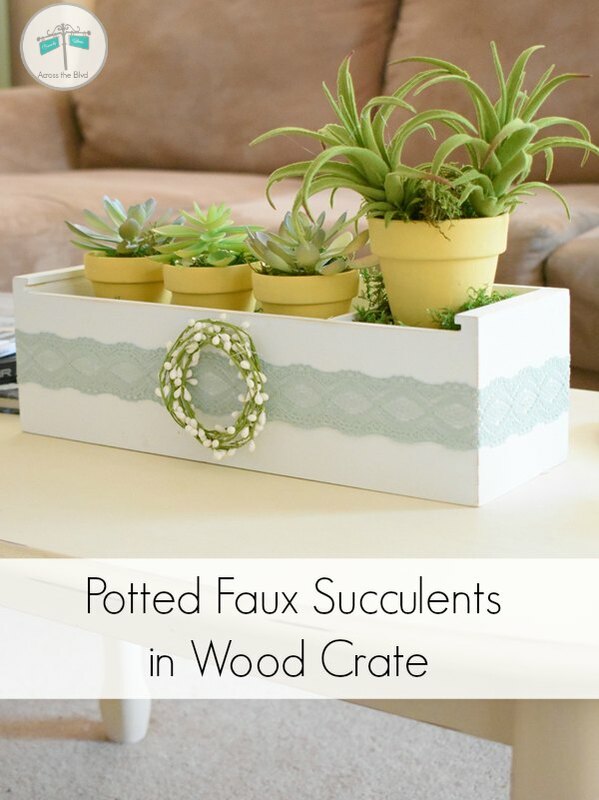 This Potted Faux Succulents in Wood Crate decor piece is easy to put together and makes a pretty spring decor item. Starting with a thrift store find crate helped keep the cost low. 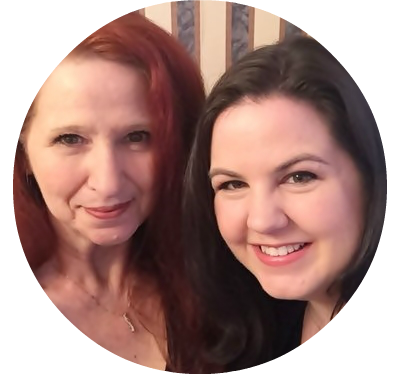 Welcome to the March Pinterest Challenge Blog Hop. Each month, a group of bloggers take the challenge to make one of the pins that we’ve saved. It motivates us all (and you, too) to not just pin, but to make it happen. 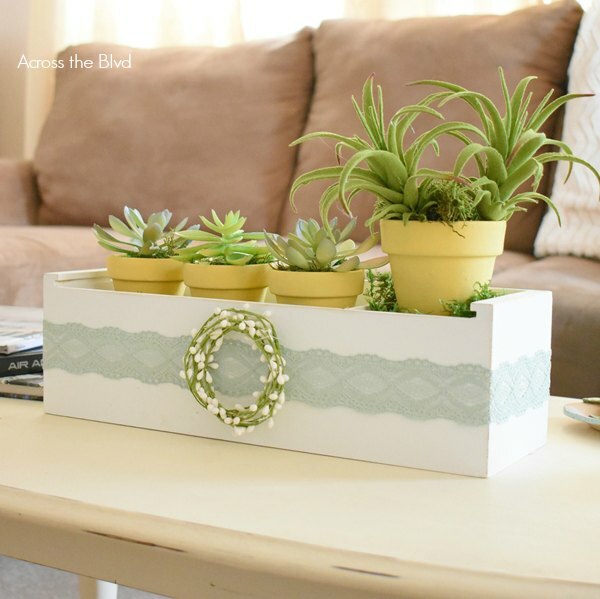 This month, I wanted to make something new for my spring decor, so I’ve put together a faux succulents in crate decor piece. I look forward to this challenge every month because it’s a great way to put my own spin on projects I’ve pinned. This month, I combined the look of a couple of different pins. 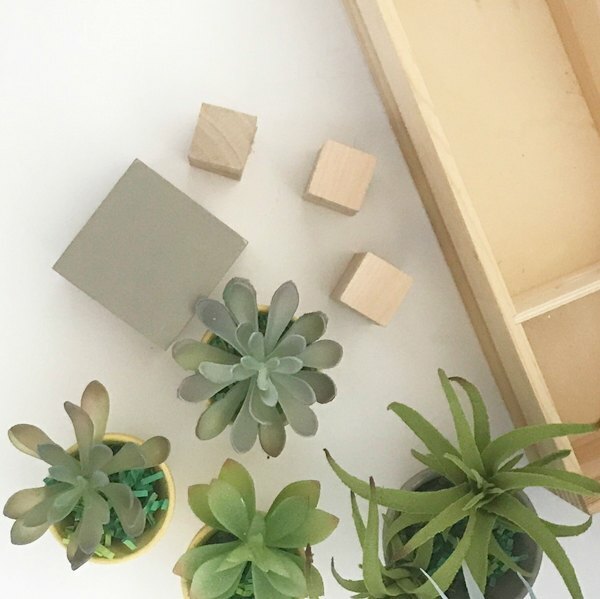 Faux Succulent Trio in Wood Crate that leads to a website that sells it for $24.95 and Faux Potted Succulents in Crate that leads to another website selling it for $17.59. Across the Blvd uses affiliate links (including Amazon). If you make a purchase, I may be compensated at no additional cost to you. Please see our Disclosure Policy for more information. Thanks for supporting our blog! 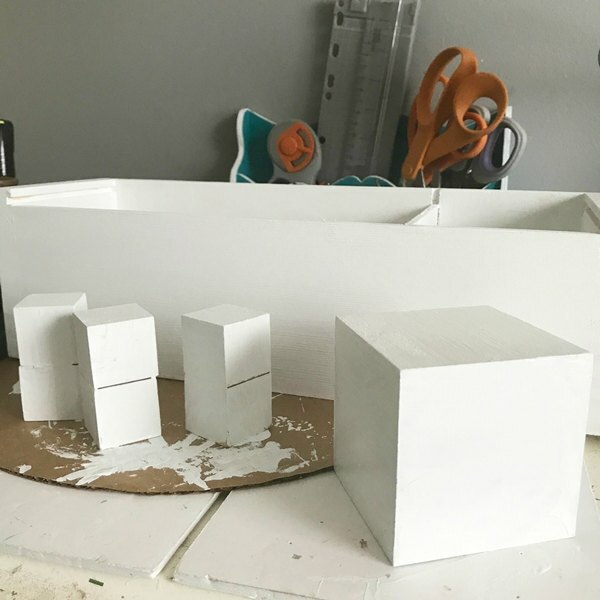 I knew that I could make a similar decor piece for a lot less than the prices of my pinspiration pieces. 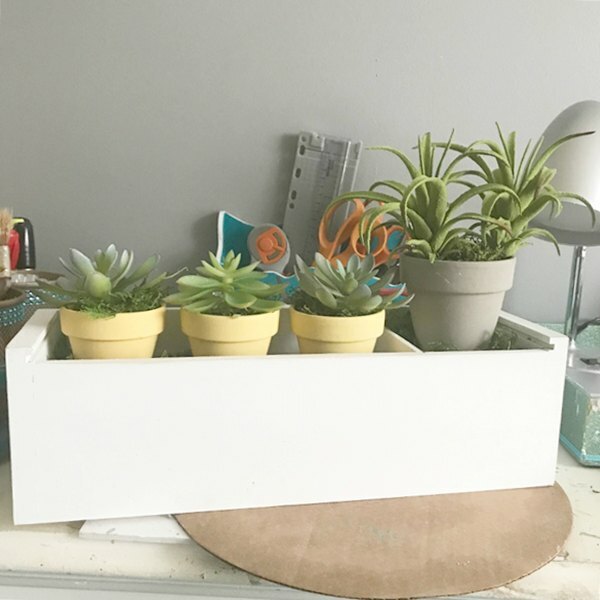 Using a thrift store find wine box and dollar store succulents kept the cost low. I bought this wine bottle crate at my local Goodwill a few months ago. 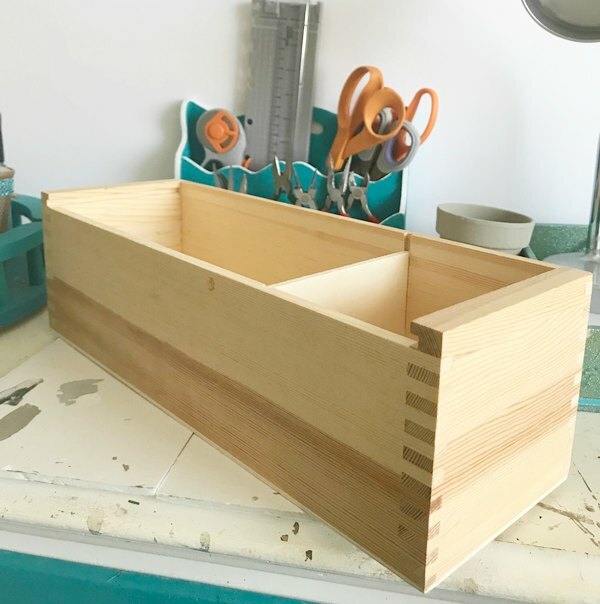 As is the case with lots of my thrift store finds, I wasn’t sure just what I wanted to do with it, but it’s sturdy and it was like new, so I knew I would find a use for it. 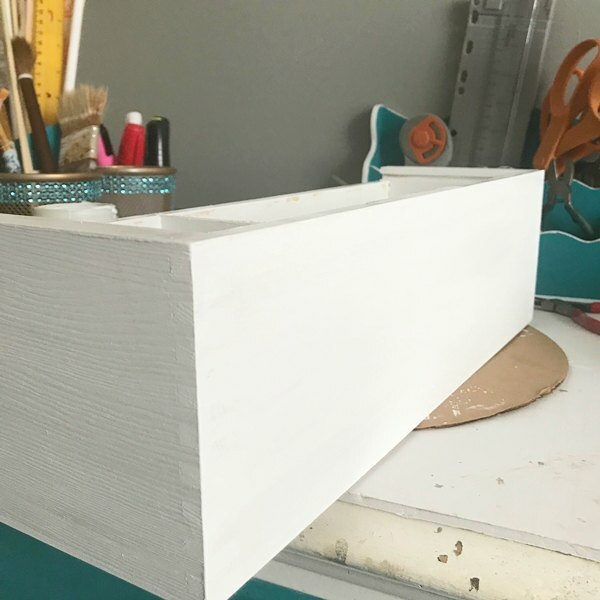 The first step was to give it two coats of Folk Art Home Decor Chalk paint. Because of the depth of the box and the size of the terra cotta pots that I had on hand, I needed to find a way to raise the pots to the right height. Sorting through my craft stash, I found several small wood blocks. I glued two of them together for a base for the pots. Three of the pots were painted with Folk Art Home Decor Chalk paint. 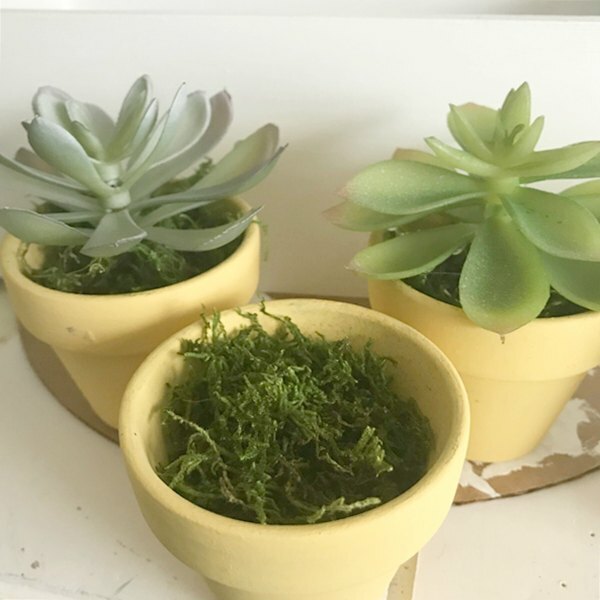 Once they were dry, I added moss to each pot and topped it with a faux succulent. I had one larger pot and decided that since the crate had a divider inside, I’d use it with a different type of succulent. I painted it gray, thinking I would like the contrast. I added more of the moss to surround each pot and to cover the blocks that I used for the bases. I added a strip of green lace ribbon around the crate. It’s hot glued in place in a few spots along the way. The finishing touch was to use a beaded floral strand that I coiled into a circle. It’s also hot glued in place. Once I had everything in place the gray just wasn’t working well with the other colors. It got a quick yellow paint job, too. I’m pleased with how this turned out and I like the combination of the two pins that I used for inspiration. What will you make next from your Pinterest boards? Very pretty! I tried to comment earlier, so this comment may be duplicated. Anyway, I wrote that I am beginning to recognize Your style after Seeing your work at the blog parties the past few months. It’s always lovely. Have a great week! 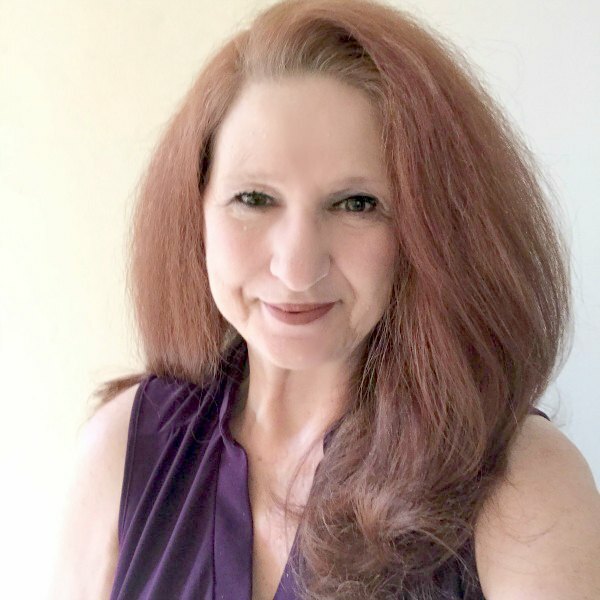 Thank you, Kristie! I love it when I recognize a fellow blogger’s style. I’m delighted that you’re recognizing mine. Hope you’re having a great week, too. So cute! I like the color combination and thats a great goodwill find. The potted succulents are so pretty. Thank you, Jenny. I’m always happy when I find a good use for one of my Goodwill finds. I’m terrible with plants, too. Thank you, Dee! What a great find and so many ways to dress this up depending on the season. Love the yellow with the green. That is so cute! I love the pale spring colors too. Pinned. Thanks, Joanne! I appreciate the pin. Adorable Beverly…I love succulents as they remind me of New Mexico and your centerpiece is perfect. 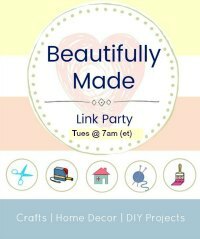 Thanks for linking up with Celebrate Your Story Link Party. Thanks so much, Kari. They remind me of the time I spent living in San Diego. I had a front yard full of succulents. Here in Charleston, they don’t grow too well, so faux ones are nice to use. Thanks for the party. Nie project! Love the colors you’ve chosen. It all works together so well! Thanks, Lydia! I’m enjoying the spring time look of it. That turned out great! I love using thrift store and dollar store items. Especially when you can make them look like that! Thanks, Cherryl. It’s always great to find a thrift store item that just needs a simple makeover. Hi Beverly. I have seen a few of these centerpieces and love your take on it. The colours you chose and so fresh and nice. I really like the little wreath center on it a well. This would be so nice in a windowsill. Thanks so much, Leanna. I’ve seen lots of them, too and I was pleased that I found a way to combine the look of a couple of them for my take on it. You know I love a good thrift store upcycle. 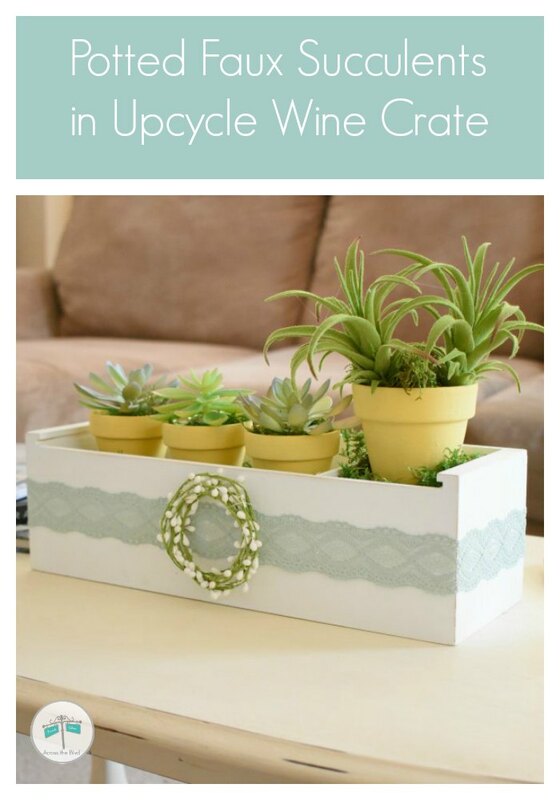 Beverly, your pretty wine crate repurposed into a succulent centerpiece is so pretty! Pinned 🙂 Thank you for sharing it with us at the Talk Of The Town party! Thrift store finds are great, aren’t they? Thanks so much, Marie and I appreciate the party and the pin! Very imaginative, Bev! Love the beaded garland that looks like a mini-wreath on the box! Perfect! Thanks, Julie! I liked that finishing touch, too. 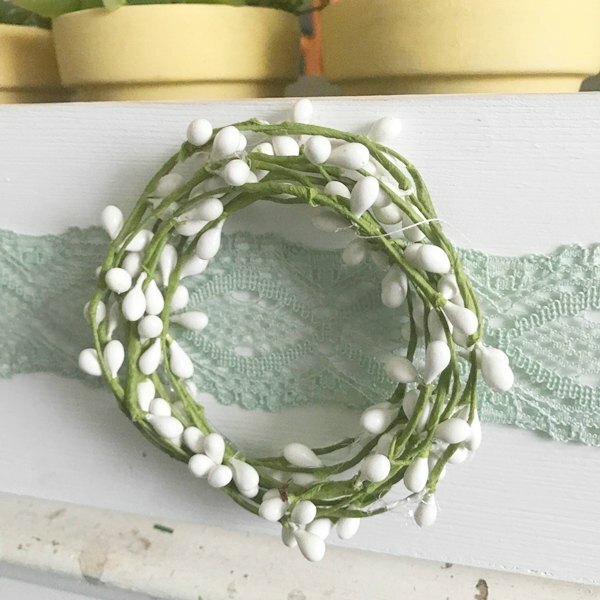 The lace ribbon and the mini wreath are adding such a lovely touch to your unique plant holder. Loved your tutorial! Thanks so much, Habiba! I’m enjoying having it on display for spring. What a fun planter for your succulents! This would be so nice in my kitchen window. Thanks for the inspiration. Thank you, Ali. It would look nice on a window sill. You know I think I have some sort of similar crate knocking about in the garage somewhere. I love how bright, fresh and spring like this is. I’ll have to have a poke about and see if I can find it. Hope you find yours, Julie. I’m sure you’ll give it a lovely makeover! That’s always fun to do and I love when I find something that can be used for decor for little money. Thanks for sharing, Carol! My daughter is in love with succulents right now – she would love this! It was easy to put together. Thanks, Roseann. Great thrift store makeover! I love succulents! The lace you added to the box is so pretty, and the addition is the beaded floral strand us awesome. It looks like a mini wreath. Thanks, T’onna! Since I’m not so great at growing plants, faux succulents are favorites of mine! Thanks, Marilyn. I appreciate the pin. Your centerpiece came out great! I love how you propped up the pots and decorated the outside for a nice spring look. Thank you, Erlene. I was glad to have a found a pretty way to use that thrift store box. Plant succulents, they said. no one can kill succulents, they said. yes, yes I can kill succulents… so faux is right up my alley! Yep! I feel the same way. I’m terrible with plants, but you can’t go wrong with faux ones!